Great job hauling off my junk. Quick, efficient, and made sure to leave nothing behind. They were friendly and respectful. Very easy app to use! I was in charge of hosting my daughter’s 40th birthday party at my house last week. The party went great but I had a ton of extra garbage and junk that I needed hauled off. I put it all out on the curb and used Lula’s same-day junk hauling service to get rid of it. It worked perfectly and it didn’t cost me much either! 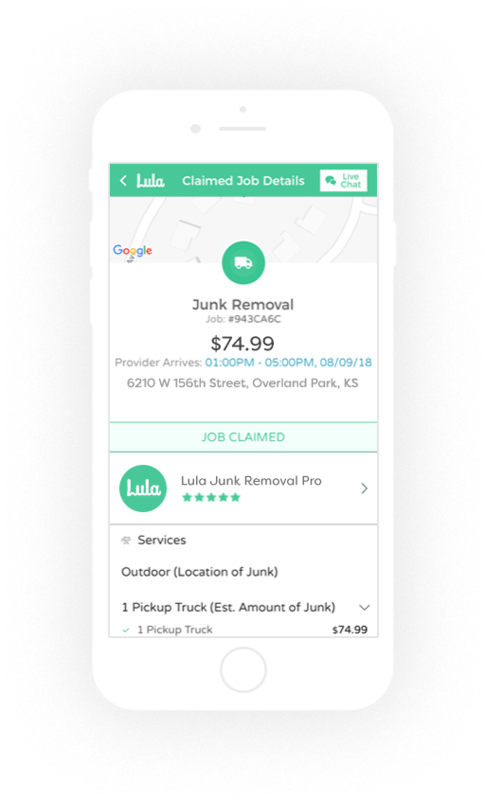 Once you’ve signed up, you’ll be able to schedule junk removal services in a matter of seconds right from our mobile app. After you’ve setup your pick up location we’ll provide you with upfront junk removal prices based on the amount of junk you have. With five different junk removal options to choose from, you’ll be able to find the right size for you. We offer everything ranging from half a truck to four truckloads. Need furniture removal service? Waste removal service? Trash removal service? Household junk removal? No problem! Choose the type of junk you have, and you’re ready to go! 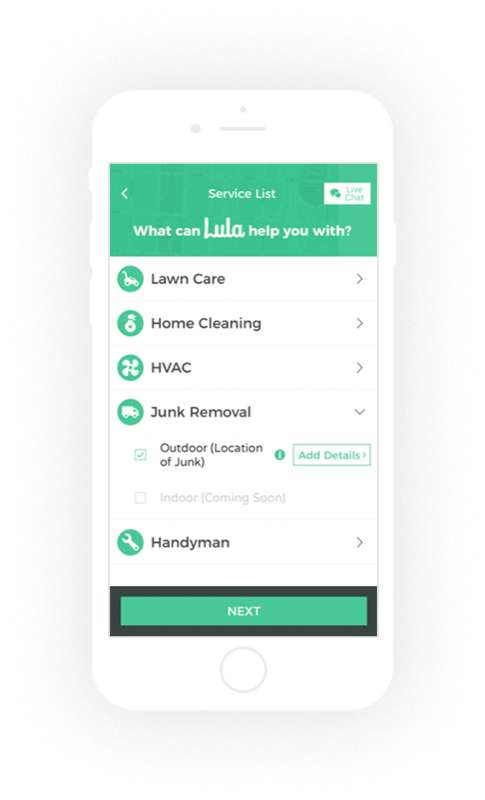 Once you submit a junk removal request, you’ll be connected with one of our Lula approved junk removal providers. 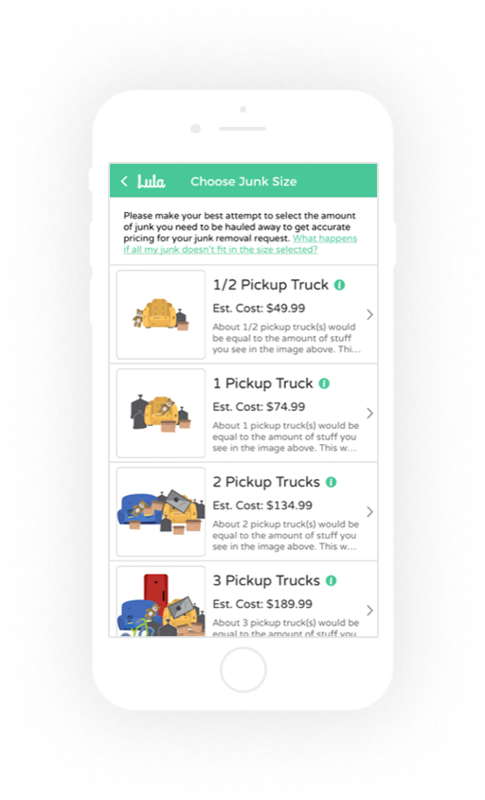 You’ll receive a notification as soon as one of our junk pros accepts and is assigned to your request. You don’t pay until the job is finished and you only pay if you are 100% satisfied. 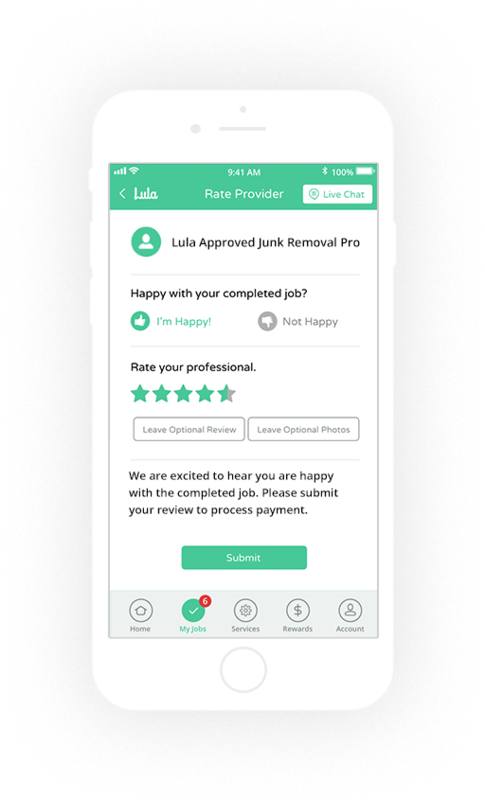 After your Lula approved junk pro finishes the work and you are happy with the service there will be an automatic transaction using your payment information on file. Use our home services app to easily schedule same-day home maintenance service from highly-rated professionals. We’ll text you a link to download the app.